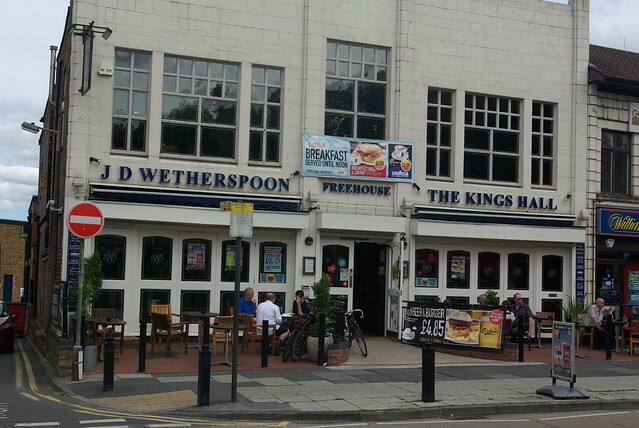 A Lost ‘Spoons: appropriately for our post on lost Wetherspoons menu items we find a picture of a a former J.D. Wetherspoon house in Cheadle Hulme. Image by Adam Bruderer, 2010 (Creative Commons License: Attribution-Some Rights Reserved). Few entrepreneurs would consider naming their business after a teacher they dreaded. In October 1979, Tim Martin did just that with a London pub. Nearly three decades on, it became one of Britain’s best loved (and equally most derided) brands. Today, any town centre worth its salt is not without a Wetherspoons house. Throughout the nineties and the noughties, J.D. Wetherspoon became a British phenomenon. During his expansionary period, supermarkets, cinemas, garages, and other commodious buildings became ‘Spoons houses. As did a few pubs (for example: the Coach and Horses in Alfreton). Either Tim Martin or J.D. Wetherspoon plc get a fair amount of stick, despite bringing affordable real ales to the masses. With Tim, it is his ardent support for Brexit, sometimes seen in the quarterly Wetherspoons News (which is probably read by more people than the Daily Mail). With their pubs, a few claims: too bland; too many wrong uns; too slow; poor food; and cold plates. How many breakfasts are served? How many hundredweight of Tikka Masalas are dished out on a Thursday? On a slow news day, changes to J.D. Wetherspoon plc’s menus have attracted more column inches than the demise of the White Moss Circular 88 bus route. I might miss the Doom Bar Pie or the Chocolate Sundae but it’s hardly life-changing compared with the loss of an important bus route. In what is both a nostalgia fest and a lament, here’s a Feast of the M60 Not So Perfect Ten on Lost Items from the ‘Spoons Menus. For some households, Sunday dinner means roast beef and Yorkshire Pudding. Maybe chicken, lamb, or turkey with the two veg. Uniting some people in the Remain and Leave camps in 2016 was the loss of J.D. Wetherspoon’s Sunday dinners. Till the summer of that year, a ‘Spoons Sunday Dinner offered you a choice of beef, chicken, pork, or a nut roast with your veggies and Yorkshire Pudding. With change from a £10 note including a drink. Before Sunday dinners were discontinued, the nut roast was replaced by the Vegetarian Wellington. Which looked like a pastry cased hockey puck with lentils and beans (still delicious though). With demand falling for the traditional main meal, its replacement came in the form of steak, fried egg and chips. With a pint, with change from a tenner. And no garden peas. Till recently, ‘Spoons houses offered a pie-based option. Before the Spring/Summer 2018 menu was published, you could enjoy the Beef in Doom Bar beer gravy pie. This was served with mash or chips and peas (garden peas or mushy peas). Better still was its predecessor, the Steak and Abbot Ale Pie. Served with mash or chips with seasonal vegetables (Julianne carrots especially) the steak pie infused with Greene King’s premium pale ale. This made for moreish gravy which went well with the steak. Unlike its Cornish ale infused successor, the Abbot Ale pie was the size of a house brick (I kid you not). As for the demise of that option, several factors may have come to play. They may have too big to finish or too expensive to make. Or party to ‘Spoons’ Trio Of Doom launch, which would have seen any one of three national real ale brands in their hostelries (Sharp’s Doom Bar, Fuller’s London Pride, and Adnams’ Bitter). As ‘Spoons dishes go, once seen, never forgotten. Nothing oozes traditional English pub food more than a Ploughman’s Lunch. Often served with a crusty roll, a generous portion of salad, some apples and grapes, and cheese, ideal for summertime. Back in the late noughties, J.D. Wetherspoon’s Ploughman’s Lunch was pretty decent fare. Its piece de resistance was the Tickler mature Cheddar cheese which gave it a kick. Why, may you ask did it disappear from the menu? Perhaps the idea of eating a Ploughman’s Lunch on a wet Monday in Luton didn’t fair well. Or ‘Spoons’ other masterstroke, the Deli Deals, were more successful. From past experience, the Ploughman’s Lunch I had at The Bankers’ Draft in Sheffield (in 2009) was pretty good. As for the weather, a little cloudy. Still, the pub was ideal for my bus to Chesterfield (for Stalybridge Celtic’s friendly against Sheffield FC at Dronfield). Till recently, ice cream of any description was a staple ‘Spoons menu item. Back in the late noughties, you could choose from three flavours of Movenpick ice creams (vanilla, strawberry, chocolate). In the last menu revision, their last ice cream based option was axed: the Chocolate Sundae. Some commentators may apportion the blame on Jamie Oliver or HM Government’s sugar tax. On the other hand, nearby ice cream parlours and gelatos may have put paid to their retention on the menu. In many a Wimpy Bar Free Zone across the UK, a ‘Spoons is your most dependable source for enjoying hamburgers on proper plates. For many customers, their burger and drink deals are a popular option. In 2013, ‘Spoons decided to add hot dogs to the menu with three versions: the Chilli Dog, the BBQ Hog Dog, and the classic hot dog. With ‘Spoons’ chilli, a surefire winner. From personal experience, the BBQ Hog Dog was a bit fiddly: topped with onions and barbecue sauce. Earlier this year, all three hot dog options were taken off the menu. Whilst 10,000 or so people were about to lose a decent circular bus route in Higher Blackley, guess which story got the column inches. ‘Spoons’ Pasty, Chips and Beans meal must have been one of their shortest lived menu items. Appearing between 2014 and 2016, the Cornish style pasty was little to write home about. According to their 2015 – 2016 calorie guide, it was only available in selected ‘Spoons houses. With the credit crunch, ‘Spoons had a brief flirtation with more wallet friendly dishes. In 2008, £2.99 could have got you sausage, chips, and beans. Yes, two ‘Spoons sausages, as used in their breakfast dishes. If you couldn’t eat the all day brunch, this was also a good alternative. Sadly, its day in the sun was pretty short. Perhaps it had a negative impact on All Day Brunch sales. Today, there is a Club day for almost every day of the week across the Wetherspoons empire. Curry Club (Thursday) and Steak Club (Tuesday) days are the chain’s most successful. Less successful was their China Club day (Wednesday). Hoping for similar success to its Curry Club, Tim and Co. aimed to perform the same magic with Chinese food. Today’s menu has a sweet chilli option, in the form of their wraps. Their Sweet Chilli Chicken Noodles was at one time the better option. Added to the menu in 2010 they had the wiry Singapore style noodles instead of the thick Udon variety. They were flavoursome and had a nice spicy kick which complemented a pale ale or lager. For our final item, we look at one which attracted the column inches this Spring. More than the loss of the White Moss Circular. Ladies and gentlemen, I would have like to have brought you an Avocado Bagel. Of late, this much-maligned sandwich option has been associated with millennials and their alleged profligacy. Then again, some ‘Spoons regulars would have wonder “why would I want an avocado bagel with my pint of Carling?” Was it a good move? Only time will tell. In nearly 40 years, Tim Martin’s empire have served many a cask conditioned ale, from microbreweries to multinational concerns. It wouldn’t be fair to say which real ales haven’t been served for years due to the ever-changing nature of brews and breweries. With Tim’s Free Trade crusade we could be seeing the end of Courvoisier and Jagermeister. In the last two decades we have seen the chain introduce free tap water. Coffee is now self-service. With stronger drinks, there are now fewer Sixpoint ales for sale, following their recent flirtation with craft cans. At one time, Shepherd Neame’s Spitfire and Courage’s Director’s Ale were regular real ales in ‘Spoons houses from Penzance to Wick. What are your opinions on our latest Not So Perfect Ten? Do you pine for the return of the Abbot Ale pie? Are there any other menu options you miss from Wetherspoons? Feel free to comment and add to this post. Next Post Stalybridge Old Band: Your Band Needs You!